Welcome to the beginner’s rune guide for Summoners War: Sky Arena! We will be briefing you a detailed tutorial for runes! For rune recommendations for monsters, click here. In short, runes are power up items that will make your unit stronger. There are currently 6 slots available in the game. 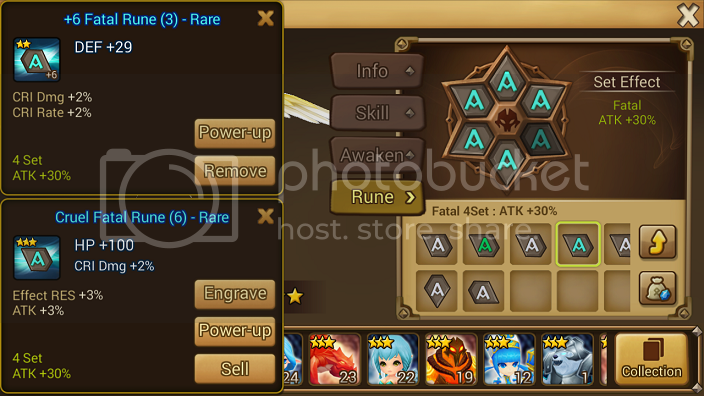 When you equip a certain set of runes, you will get bonus stat effects. For example, if you equip 4 fatal runes, you will get the set bonus of attack +35%. Some set effects require 2 to get a bonus while others require 4. Below is a quick table to show you the effects and where to get them. When you power up your runes, it gains bonus stats at levels 3/6/9/12, up to a max of 15. At level 15, the main stat increases by 20%. Keep in mind that level 0 runes can be dropped as a Magic/Rare/Hero/Legendary. That means it will already have bonus stats at level 0. If you manage to get your hands on them, it will upgrade a random bonus stat or give you a new bonus stat if there is room for one. The color of the common rune will change when you power up at intervals 3/6/9/12. To make it short and sweet, slots 2, 4 and 6 are available to be customized the most based on your monster needs. If you are looking for rune recommendations for each monster, check out the monster page. The options gained from the runes are quite random, so it all comes down to a bit of luck. Here is a rune stat chart on the stats you get when powering up. The stats are sorted by the base, increase when powering up and then finally the maximum stat. Runes can have an innate stat located right under the main stat. This stat is random unfortunately. This stat will never power up no matter what +X you have it at. Keep that in mind. Hell difficulty drops 3-5★ runes (Please take note that regular stages can drop 5★ runes, but it is quite rare. Please take note that Hell difficulty bosses can drop 5★ runes, but it is quite rare. If you want Despair or Vampire runes, you will need to do Giant’s Keep and Dragon’s Lair respectively. You can also get them from your magic shop. They sell runes according to your level. It refreshes every hour, so do check frequently to see what kind of runes are available. You can find really good runes and sometimes good monsters as well. It requires mana stones to remove a rune from your monster.